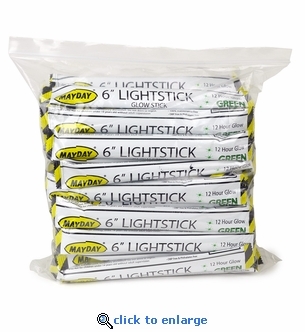 This 50 pack of green lightsticks will glow for up to 12 hours. Glow sticks are great to have when camping or during a power outage. Lightsticks have many safety and emergency uses at home, work, camping and travel and even more entertainment uses for kids. The chemicals used in glow sticks are non-toxic, do not produce heat and is non flammable. Each lightstick comes with a string attached so it can be used as a neck lanyard or tied.